Like I said, busy times. Next Monday, Churches United for Fair Housing is sponsoring a debate for the candidates in the 34th Council District (Reyna) race. 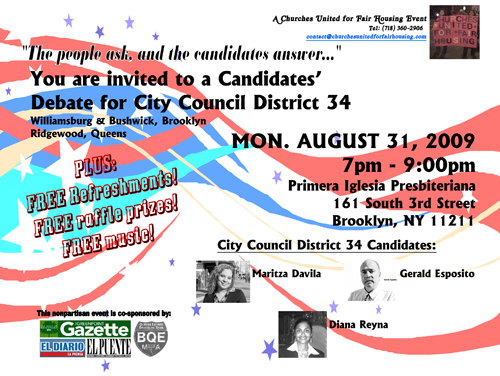 It’s not clear if all of the candidates (Maritza Davila, Gerry Esposito and Diana Reyna) are going to show. Given that this is the only debate, forum or reception for the candidates in this race, it would be a shame if anyone was a no-show.